NEW YORK (CNNMoney) -- The Chevrolet Volt will be available in all 50 states by the end of this year, GM announced Thursday. "We're accelerating our launch plan to have Volts in all participating Chevrolet dealerships in every single state in the union by the end of this year," said Rick Scheidt, U.S. vice president, Chevrolet Marketing. "This is the right thing to do for our customers and our dealers who are seeing increased traffic onto their showroom floors." Volt sales will begin in all 50 states in the fall, GM (GM) said. Until then, the Volt will only be available in a handful of states. The automaker said it needed to exercise caution with the introduction of such new technology. GM is also exploring ways to increase production of the car, Welburn said. GM had said it would build only 10,000 Volts by the end of 2011 and 45,000 by the end of 2012. Chevrolet Volts have already been delivered to customers in the Washington D.C. area, as well as California, New York, Connecticut, New Jersey and Texas, GM said, with customer deliveries beginning in Michigan this spring. Powered by a lithium-ion battery pack, the Volt will be capable of traveling up to about 35 miles on purely electric power once it's been fully charged, according to EPA estimates. For driving beyond that range, the Volt has a four-cylinder gasoline engine to generate electricity to power the wheels. "The Volt is clearly bringing new customers to Chevrolet," Harry E. Criswell III, president and owner of Criswell Chevrolet in Gaithersburg, Md., said in the GM statement. 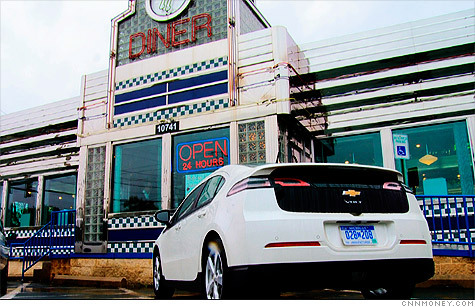 "We are seeing 10 to 15 customers a week who are seriously considering buying a Volt. Many of them own competitive brands and now have a Chevy on their shopping list because of the Volt." Criswell's dealership had sold its full allotment of 34 Volts before the car had even gone into full production, GM's vice president for design, Ed Welburn, said in a speech at the Washington, D.C. Auto Show. Part of the interest has been driven by the fact that the Volt has won a number of awards, Criswell said, including Motor Trend Car of the Year and the North American Car of the Year award.